PG&E’s regulator-mandated HAN pilot includes early deployments with Silver Spring Networks and Control4—and a lot of variables to be worked out in coming years. Pacific Gas & Electric has taken the regulator-mandated plunge into home area networks -- and for its initial 500-customer pilot, it’s going to be using software from Silver Spring Networks and home energy dashboards from Control4 to do it. That’s the short version of the 23-page plan PG&E submitted to the California Public Utilities Commission on Monday (PDF) on how it will allow customers to access their home energy data, at first via smart meters, but later by a host of different methods. However, while it’s certainly good news for Silver Spring and Control4, it doesn’t guarantee them a lock on PG&E’s ongoing plans to link its customers to their energy data. That’s because PG&E and the state’s other two big utilities aren’t just under CPUC mandate to have a home area network (HAN) plan in place by March 2012. They’re also being asked to eventually open their HAN systems to multiple vendors and third-party providers of home energy management services -- all while keeping customer data private and secure. - By March 2012, PG&E intends to have deployed Silver Spring’s UtilityIQ HAN communications manager software as the system to run its 500-home pilot. That’s not too surprising, given that Silver Spring networks all of PG&E’s smart electric meters, and PG&E’s filing notes that it has been working with the company on this since August. Still, it’s a nice proving point for the Redwood City, Calif.-based startup’s software that manages in-home devices that link to smart meters via ZigBee wireless networks. PG&E and Silver Spring will be testing and certifying the meter firmware’s capabilities, as well as doing customer registration and support in advance of the March rollout. Silver Spring’s UtilityIQ platform is also being used by utility clients such as Oklahoma Gas & Electric. - From March 1, 2012 to July 30, 2012, the deployment will be executed, with 500 homes (both customer volunteers and PG&E employees) set to receive Control4’s EC-100 In-Home Display device. That’s the Salt Lake City-based home automation company’s energy-specific dashboard, designed to come in at a sub-$200 price point, compared to the more expensive, custom-designed home automation projects that make up its bread-and-butter business. It’s being used by utilities, including OG&E and Nevada’s NV Energy. 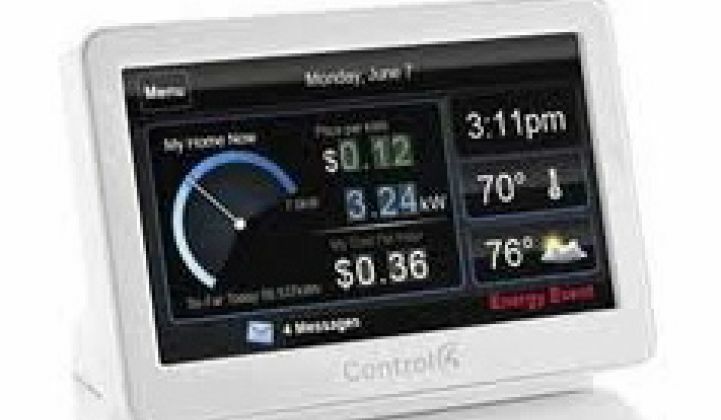 While Control4’s dashboard will be communicating with PG&E’s smart meters via ZigBee wireless, the dashboard also has Wi-Fi connectivity and can serve as a gateway device allowing access to internet-based data. But PG&E notes that “use of the Wi-Fi capability is currently under review by PG&E to ensure it addresses appropriate security and privacy concerns.” The utility has stated that it won’t turn on the Wi-Fi capabilities if the security risks are deemed unacceptable. That’s important to remember in covering the future phases of the HAN pilot, which intend to incorporate all kinds of devices, using different communications technologies. Another important note: PG&E will provide in-home professional installation of its first 500 in-home devices, just to make sure there’s a “positive, success-oriented customer experience upfront.” But it also makes clear that this isn’t a cost-effective solution in the long run: eventually, these things will have to be able to be registered and activated by customers themselves. That step will also lay the groundwork for linking up in-home energy management devices via other means, such as by broadband and home Wi-Fi networks. Even so, PG&E makes it pretty clear that it would prefer to have at least a minimum of connectivity come via its smart-meter-to-home ZigBee radios. That’s because the smart meter network is “perceived by some to be more reliable for key messages (e.g., demand response) than third-party-owned internet connections within a home,” PG&E noted. As for people who say that broadband internet connections are a better way to link customers to utility energy data, PG&E notes that about 30 percent of California residents don’t have broadband to the home. - Between August and December of 2012, PG&E will start assessing the market for in-home display and gateway devices that it can use for its second, 5,000-customer “early adopter phase.” CPUC has asked the state’s big utilities to make customer energy data accessible to third-party technology providers, if the customer says it’s OK to do so -- but it has also ordered the utilities to make sure that the interchange of data is secure and privacy-protected. These devices will be using ZigBee Smart Energy Profile 1.x, the current iteration of ZigBee for energy management now in use in Texas and other utilities around the country. But PG&E has always said it wants to wait for the next version of Smart Energy 2.0 before doing a mass rollout, since SE 2.0 will also include interoperability with Wi-Fi and HomePlug powerline carrier technologies. I’m guessing that PG&E and CPUC may have a hard time managing the tension between waiting for SE 2.0 to be ready (which isn’t expected until late 2012 at the earliest) and rolling out devices to customers as quickly as possible. One option may be devices that come with modular communications slots on-board, allowing customers to switch out SEP 1.x cards for SE 2.0 cards once they’re available. PG&E cites the example of USNAP, an emerging modular comms scheme, as one solution. - The 5,000-customer pilot is set to begin in early 2013, and will come with some intensive customer outreach and support to work out the kinks in the deployment. As noted, PG&E has to worry not just about whether the system works technically, but whether it complies with the complex set of regulations on privacy and security. That means that, for the foreseeable future, PG&E is going to be running all customer devices over its Silver Spring software management platform. Still, the utility is keeping its eyes open for “alternative solutions,” like home gateways that manage smart thermostats, smart appliances and other energy-smart household devices independently of the utility. If all goes well, PG&E plans a “Mass Market” phase in the 2014-to-2015 timeframe, in which it will open up its HAN platform to all third-party devices that meet its certification and registration standards. We've got a long way to go from here to there, of course.